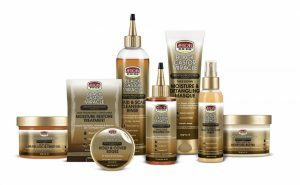 SAVANNAH, Ga. — African Pride, a hair care manufacturer with more than 30 years of experience creating quality, affordable products, has introduced its Black Castor Miracle collection. The eight-product range provides women with a simplified regimen to change the way they care for their hair before, during and after wearing protective styles; which include braids, locs, weaves, wigs or any other hairstyle that tucks the ends of your hair away from constant manipulation. African Pride’s NEW Black Castor Miracle collection. Each product in the Black Castor Miracle line was specifically formulated with black castor oil; the number one ingredient associated with hair growth and other premium, all-natural ingredients like coconut water, jojoba, tea tree, peppermint, coconut and soybean oils, coconut milk and shea butter. The simplified Black Castor Miracle regimen covers the key phases or steps in the life cycle of a protective style: (Step 1) moisturize and prep, (Step 2) style and protect, (Step 3) refresh and seal and (Step 4) takedown and detangle, all while nourishing the hair and scalp, sealing in moisture and protecting against styling damage that may cause breakage; helping to retain length while promoting healthy hair growth. Prep & Leave-In Moisture Butter (8oz) – Moisturize and prep hair before braided, weaved or protective styles with this specially crafted blend of black castor oil, shea butter and jojoba oil which penetrates hair strands, providing long-lasting hydration and protection against breakage during styling. Anti-Humidity Heat Protectant Spray (4oz) – Provides 400°F heat protection and guards against heat damage when blow drying, flat-ironing or straightening leave out, weaves and edges. Specially crafted with a keratin complex, this light-weight formula blocks humidity, seals in shine and keeps hair straight for up to 2 weeks or until your next wash day. Braid, Loc & Twist Gel (8oz) – Smooths frizz and fly-aways while boosting shine, for longer lasting styles. Leaves braids, locs and twists neat and smooth and can be used to slick edges or finish desired styles. Hold & Cover Black Edge Gel (2.25oz) — Slicks stubborn edges, temporarily covers gray hair and fills in thinning edges or part lines. Braid & Scalp Cleansing Rinse (12oz) – Uses a special blend of micellar water, black castor, coconut and peppermint oils to gently cleanse and condition hair, edges and scalp during braided styles and under weaves without causing frizz. Soothes scalp and calms itching; leaving hair refreshed and styles lasting longer. Hair & Scalp Sealing Oil (6oz) — Locks moisture into hair strands and improves moisture retention, while helping to condition hair, soothe scalp, calm itching and prevent dryness. Great for braids, crochet styles, edges, under weave care and protective styles. Moisture & Detangling Masque (8oz) – Softens, conditions and removes knots or buildup from dry, tangled hair after braided, weaved and protective styles. Helps to prevent excessive breakage and shedding. Moisture Restore Treatment (2oz) – Deep conditioning treatment infused with coconut milk and shea butter that hydrates and restores moisture to extremely dry, damaged hair. Each item in the Black Castor Miracle collection is priced between $4.49 — $4.99 and is available at retail in February. The Black Castor Miracle collection will be featured in Cosmopolitan Magazine’s popular series ‘THE BRAID UP’ on YouTube in mid-February.